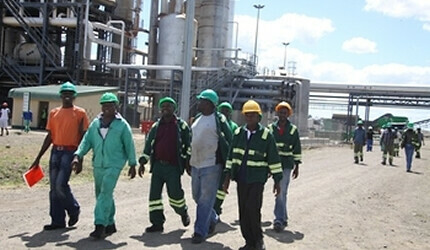 Chisumbanje Ethanol plant re-opened in Zimbabwe on March 25, 2013. The Southern African nation has a policy of indigenization and Look East., a photo by Pan-African News Wire File Photos on Flickr. The first three months of mandatory ethanol blending of petrol saw Zimbabwe’s fuel import bill cut by nearly us$20 million with larger savings now expected since this was the period when blending rose in steps from 5 percent to 15 percent. By March, Government expects the ethanol percentage in petrol to reach 20 percent. Zimbabwe has been importing more than it exports since the switch to multiple currencies. Wealth created by Zimbabwean economic activities has thus been exported, rather than retained to boost economic expansion. The negative trade balance has delayed the rebuilding of Zimbabwe’s savings and has severely limited the amount of money available for investment and productive lending by banks. Mr Nyabadza said only 4MW out of the 18MW went to the national grid as the power line connecting the station at Chisumbanje was still being upgraded. He said the implementation of Green Fuel project, which is spearheading the production of ethanol, was successfully completed. Under the first phase, which started in 2008, Green Fuel managed to reach a target of production of 120 million litres of ethanol and employed 5 500 people. At least 1 000 hectares of irrigated cane was developed and they are benefiting more than 4 000 families. Mr Nyabadza said the second phase of the project, which is starting this year, will result in a significant increase in the company’s work force to 7 700, while reducing the fuel import bill by us$9 million per month. He said other downstream benefits targeted this year included increasing irrigation hectrage for the community to 1 500 hectares that would benefit 6 000 families. “Following the overwhelming support that we get from the Government, we are planning to increase blending levels to E20 and establish flex fuel conversion centres in other cities such as Bulawayo, Gweru and Mutare,” he said. Flex fuel conversion is done on particular vehicles so that they are able to efficiently use much higher ethanol levels in blended fuel. Mr Nyabadza said a grand business tour of the ethanol plant in Chisumbanje was on the cards before the end of this month. He said the tour would enable those in other sectors to see how they could tap other benefits that accrue from the large project. Sources said the project was a game changer in Zimbabwe’s economy as efforts were already under way to resuscitate Quest Motors in Mutare to assemble flex fuel vehicles. Apart from the most obvious benefits, investment in sugar would greatly boost the standards of living among small-scale farmers, whose participation is important to enhance more production. With land reform, cane production in the Lowveld has largely switched from estate grown cane to smallholders but with investors owning the costly sugar mills and now the modern ethanol plant and buying cane from the farmers, often in contract schemes that see the farmers obtain inputs, including the costs of irrigation, from the eventual buyers of the cane. The Chisumbanje Ethanol Plant is jointly owned by Government through Arda and two private investors Macdom Investments and Ratings. The US$600 million project was hampered by serious political bickering during the tenure of the inclusive Government, with the MDC-T side of Government branding the project a Zanu-PF project. After the July 31 harmonised elections, the new Zanu-PF Government quickly moved in and introduced mandatory blending. In the 1980s an older-technology ethanol plant in Triangle saw Zimbabwe’s petrol contain about 20 percent ethanol. After almost a decade at this level the plant went out of commission during the worst drought on record at the the start of the 1990s.